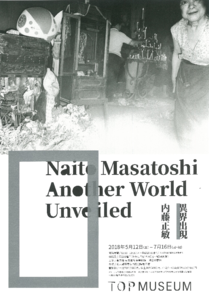 The Tokyo Photographic Art Museum is pleased to announce the exhibition Naito Masatoshi: Another World Unveiled, a career survey of the maverick photographer, which spans over fifty years. In the 1960s, Naito engaged in depicting the formation of life and the universe, as captured through microscopic photographs of substances undergoing chemical reactions. Shortly after, Naito discovered the sokushinbutsu culture of Yamagata Prefecture’s Mount Yudono, which would ultimately define the course of his career. From the 1960s through the 1980s, Naito documented the folk religion of Tohoku [northern Japan], including the poignant Old Hags Burst Out! and Tono Monogatari [The Tales of Tono] series. Responding to the inherent questions posed by his own photography, Naito delved deeper into folklore studies. A range of subjects—Tohoku and Edo/Tokyo, science and religion—become a gateway for Naito to explore the shadow world underlying the commonly seen culture of Japan. In the 1990s, Naito embarked on another series, Another World of Deities where the artist’s imagination and folkloric studies came together in the divine mountains of Japan, home to the discipline of Shugendo. Employing the camera as a “magic tool to perceive the intangible,” and folkloric studies as a “camera behind the camera that makes it possible to see an invisible world,” Naito unveiled a phantasmagoric world. His vision will make you tremble in fear and at the same time open your mind’s eye to the depths of your being. The present exhibition—the photographer’s first large-scale retrospective in a Tokyo museum—looks at a body of work produced over the past half-century to highlight the penetrating vision driving the artist’s idiosyncratic perception of life and the universe. Born in Tokyo in 1938 and studied chemistry at Waseda University prior to choosing his path as a freelance photographer. His early focus was on the phenomenon of life and the universe through works dubbed “science fiction photography” by the artist himself. At the age of 25, his chance discovery of sokushinbutsu culture opened the path to his life’s work in the mountains of northern Japan, where Naito eventually trained as a Shugendo master. Photography books published include Baba: Tohoku no Minkan Shinko [The Old Women: The Folk Religion in Tohoku] (1979), Dewa-sanzan to Shugen [Three Mountains of Dewa and Shugen] (1982), Tono Monogatari [Tales of Tono] (1983), and Tokyo: A Vision of Its Other Side (1985). In addition, Naito is an extensively published scholar and researcher in the field of folklore studies. His prolific writings include monographs and other publications on folkloric research. 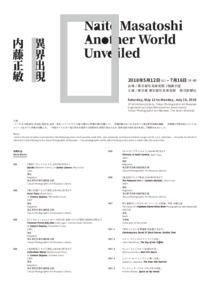 Naito was formerly a professor at the Tohoku University of Art and Design graduate school of design and engineering, and a research scholar at the Tohoku Culture Research Center.